In classic Wilson decision-making style, we decided to visit the beach over the weekend Saturday morning. We packed haphazardly, hopped in the car, and headed straight for the ocean. Side Note: My little corner of heaven will be filled with the sounds of crashing waves, rolling winds, Bach’s Suite for Cello in D, and Eva’s baby laughter. I love the ocean. This morning we got up at 7:00 AM, had breakfast at our favorite spot with our favorite waitress, and got back on the beach by 9:00 AM. 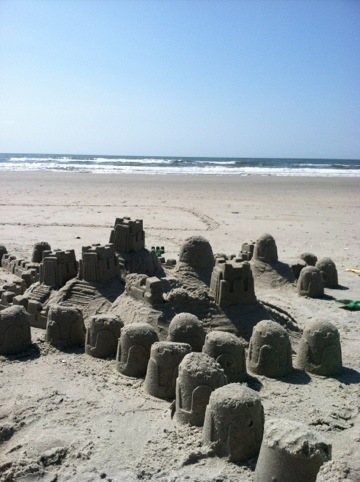 First, we built an epic sand castle. The only thing that could have made building this better would be my sister’s help. She should have totally been here instead of plowing through her last month of college. And then, Eva made a friend. This sweet little girl is about a year younger than Eva, had the cutest little Charlotte drawl, and was a doll. They took a couple minutes to warm up to each other but, without even saying hi, they were best friends. They ran and screamed and dug holes and fetched water back and forth in pails. They laughed and shared and talked and splashed and played in the mud. Looked like they had a marvelous time. It was beautiful watching them. They’d never met before. They kept forgetting each others’ name. But they didn’t disagree, they shared their toys, they compromised. They played well. Halfway into their playtime, I started to wonder why adults can’t always do that. I hadn’t talked to the little girl’s mom and she hadn’t spoken to me; her mom was sitting in her chair reading while the girls played near our chairs. Eventually, we talked and got to know each other a bit. Their beach house is just around the corner from ours so I hope we run into them again over the summer. But if it hadn’t been for Eva and her daughter playing together, it would not have even occurred to me to introduce myself or speak to her. Now, to be fair to myself, I introduce myself to strangers constantly for work (sales) so it’s not like I’m some crazy snob or anything. Ok, maybe I have some innate snobbery but I am trying to work on it, thanks. But what I am curious about is how many meaningful interactions we miss out on as adults. 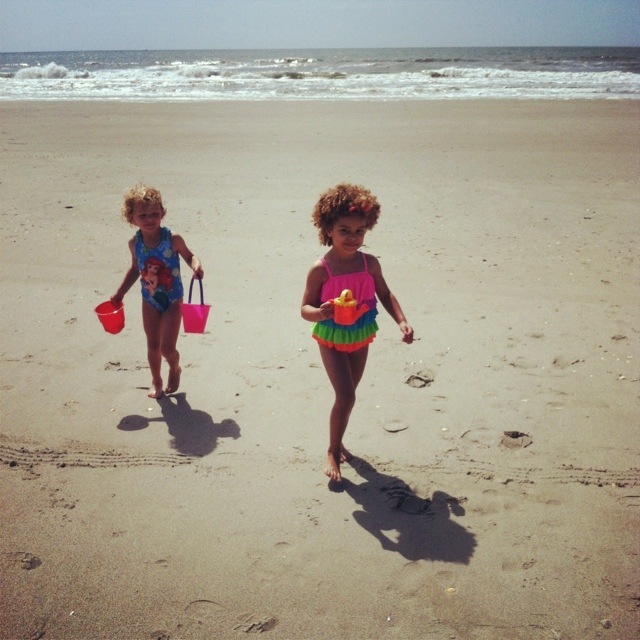 Our little girls were so open to each other, so uncomplicated, so ready to be great friends. Granted, their interests are much simpler: play and play and…yeah, that’s it. Just play. Where as adults have a huge range of interests and belief systems. But that doesn’t mean we can’t look at people (at least initially) with the hope that there could be a friendship waiting. I want to be more open. We’ve been back in North Carolina for over two years now and I am just starting to feel some roots taking hold. I blame myself for not getting us out there and finding/making more meaningful connections. But a new church home and some really solid friendships that have grown beautifully in the past year give me a basket of hope that more roots will settle soon. What kinds of friendship and love can we add to our lives by just being a little bit more open? I am eager I find out.